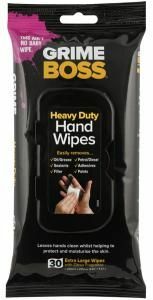 These amazing Grime Boss wipes are the best for cleaning our craft tools, hands and mats! Perfect for us crafters for getting the sticky stuff off our tools and mats, but also great for wiping off inks and just about everything else! This is for a 30 pack of wipes.